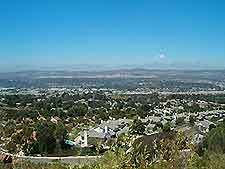 John Wayne Airport (SNA) stands in nearby Santa Ana, California (CA) which is around 13 miles / 21 km from central Anaheim and 35 miles / 56 km to the south of Los Angeles. This airport serves a number of major American airlines, handling around 10 million passengers each year. John Wayne Airport contains two terminal buildings, with good general facilities Airlines include Alaska Airlines, American Airlines, Continental Airlines, Delta Airlines Northwest Airlines, Southwest Airlines and United Airlines. John Wayne Airport is situated close to a number of main highways and the journey into nearby Anaheim city center should take around 30 minutes, provided that traffic levels are favorable. The journey to and from the airport is well signposted. 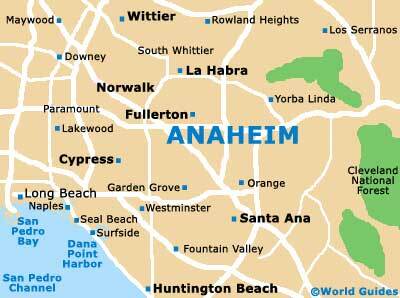 Airport buses travel to a number of nearby destinations, include Los Angeles and Anaheim. Operated by Airport Bus and the Orange County Transportation Authority, these public buses are an inexpensive way to travel to and from the airport. Shared shuttle buses are also available at the airport and can be found outside of the John Wayne Airport Ground Transportation Center. Taxis and plentiful at John Wayne Airport and are operated by the Yellow Cab Service. Providing a convenient method of transport at the airport, any additional taxi charges should always be agreed in advance.